In The Rural Northwest, A Growing Market For Survivalist Homes A Montana couple is looking to meet a growing demand in the real estate business, at least in the rural Northwest: off-grid properties that include bunkers and secret rooms. At first glance, real estate agent Theresa Mondale's listings don't sound too different from those of other agents trying to sell a piece of Montana paradise: 270 acres at the base of the Bitterroot Mountains completely surrounded by U.S. Forest Service land, stands of old growth fir and cedar trees, a spring with pure water. Only when you read on do you discover this isn't your average vacation cabin. One listing boasts of a modified bunker with a "very secure" iron locking door on the property and a root cellar that could be turned into an alternative living situation. Another one mentions a yard with space to land a helicopter "if the need is there." Welcome to the world of sustainable, survivalist real estate. 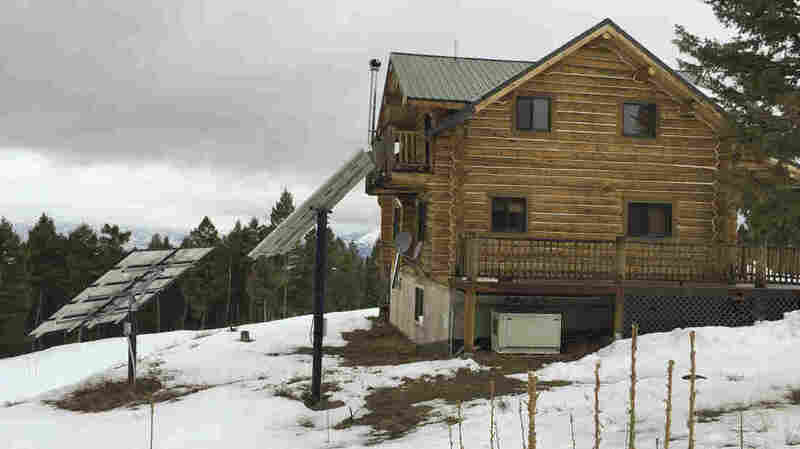 There's a growing market for this kind of off-grid property. Mondale figures over the past six to eight years, sales of these survivalist properties have risen by 50 percent. "It seems like over the past few years, there's just this need, I don't want to say panic or frantic, but people feeling the need to be able to have someplace to go," Mondale says. A lot of Mondale's clients are worried about some pretty heavy things, and they're looking for places that are advertised as defendable. "Whether it's the fiat money system finally coming down, societal collapse, global warming causing flooding," Mondale says. She's heard pretty much every reason, and she doesn't question her clients. She's just here to help them find the right fit. Despite the remoteness of these homes, they're not backwoods shacks with sagging metal roofs. Some of her listings sell for more than $1 million if there's a lot of land and if water rights are included. 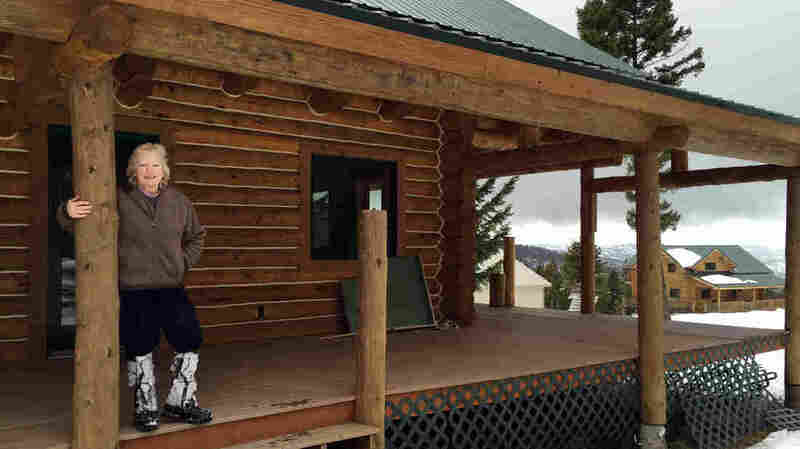 The one with the helicopter pad is a spiffy, two-story log home with a wraparound porch. It has solar panels and inside, a backup generator, luxury bathrooms and a kitchen with granite countertops and stainless steel appliances. "Just because you're off-grid or being sustainable doesn't mean you have to be looking like the old hick miner," she says, laughing, "with grass on your roof or whatever. You can do anything." In the 1990s, the remote Montana mountains developed a reputation as an enclave for Y2K worriers, doomsday cults and the Unabomber. The state still gets made fun of a lot. Mondale is sensitive to this. One of her current listings was previously owned by one of those doomsday cults, but, she says, what's going on today is different. People want to be more self-sustaining, less dependent on the outside, grow their own food, that kind of thing. "These are not crazy people," she says. These off-grid listings are hardly backwoods shacks with sagging metal roofs. Most are luxury homes with modern amenities powered by solar panels and backup generators. Mondale and her husband don't just sell this lifestyle. They live it, too. They consider themselves "preppers." Inside one of their garages is 1,200 pounds of meat they either raised or hunted. There are canned beets from their garden, tomatoes, zucchini and garlic. They even make their own garlic powder. Tim Mondale is a general contractor who builds bunkers and secret rooms for these types of properties. "We still work, we have normal jobs, and we save our money but we just protect ourselves differently than a lot of people that live in the big cities," he says. But don't bother asking him to see one of their hidden rooms. "Looking at somebody's secret cache room, their bunker, their hideaway places throughout their house, people will not show you that," he says. "I mean, close family doesn't see that stuff until it's time." The Mondales just bought an 80-acre spread of their own in the mountains northwest of Missoula. There's a stream, plenty of space for a garden and most important, they say, the neighbors won't even know they live there.